6p cGOLIATH INDUSTRIAL TOOLMountable Socket Organizer Rail Set. Heavy Duty Molded ABS Plastic Allows For Shallow Or Deep Sockets. A Quick And Easy Way To Organize Cluttered Toolboxes And Work Areas. 6pcs Socket Organizer Tray Rack Storage Holder Tool Metric SAE 1/4" 3/8" 1/2"
Quantity: 6PCS (2pcs for each size). 6PCS Socket Trays. SAE Deep & Standard: 1-1/4, 1-1/8, 1-1/16, 1, 15/16, 7/8, 13/16, 3/4, 11/16, 5/8, 9/16, 1/2, 7/16, 3/8 in. Fit for socket size: 1/4", 3/8", 1/2". Trending at $32.99eBay determines this price through a machine learned model of the product's sale prices within the last 90 days. Black bottom soft padding to help protect your tools. It is rivet reinforced on stress points for added durability. Designed for bulk storage of fasteners. Reinforced wear points for added durability. Sockets are not included with the holder. 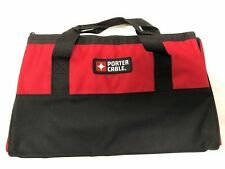 PORTER CABLE HEAVY DUTY TOOL STORAGE BAG. HEAVY DUTY ZIPPER. CONTRACTORS BAG TRAVEL BAG. WILL FIT A VARIETY OF CORDLESS OR ELECTRIC TOOLS. This bag has solid runners on the bottom. 13" Long x 9" Wide x 10" High. 6pc GOLIATH INDUSTRIAL TOOL Socket Tray Set. Heavy Duty Molded ABS Plastic Trays With Stubs To Fit Shallow Sockets In The Front And Deep Sockets In The Back. Each Socket Tray Is Labeled With Sizes. Sockets Snap In And Out Quickly. You do not have to be unprepared. horusdy Tools 3 Pcs Kit Socket Rail. Brilliant Red, Blue And Orange Colors Make Identifying Between Drive Sizes Fast And Easy. All products are quality checked. searching for the right one?. 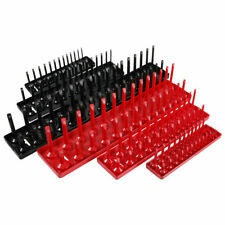 80 Industrial ABS Mountable Socket Storage Rail Rack Holder Organize 1/4 3/8 1/2. Universal twist-lock socket set organizer tray with 3 socket rails. Perfect for storage in the drawer, on the bench, or on the go; holds 80 sockets. This bag has solid runners on the bottom. 15” Long x 10” Wide x 11” High. Hansen Global: a leader in tool organization! Want More Hansen Tool Organization?. 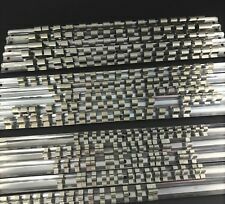 - SAE Deep & Standard: 1-1/4, 1-1/8, 1-1/16, 1, 15/16, 7/8, 13/16, 3/4, 11/16, 5/8, 9/16, 1/2, 7/16, 3/8 in. 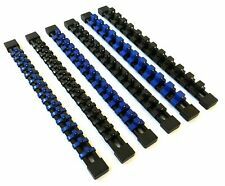 - SAE Deep & Standard: 1, 15/16, 7/8, 13/16, 3/4, 11/16, 5/8, 9/16, 1/2, 7/16, 3/8, 5/16, 1/4 in. New Makita 21” Large Heavy Duty Tool Bag 6 Pocket outside No Shoulder Strap GIFT. Both bags are supple and strong, constructed from heavy duty flexible material that takes up less space than bags made from stiff materials. Tool Bag Combo Will Organize All Your Tools. 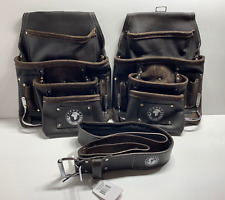 Up for sale 1 - New Ridgid Large Heavy Duty for 5 piece combo kit 6 Pocket Tool Bag. Tool Box Type: Rolling Tool Box. Portable: Yes. 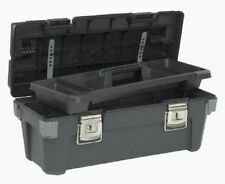 Tool Storage Product Type: Tool Box. Tools Product Type: Tool Storage. In the case of factory defects, if available, we will replace the product for you. The rich OIl tanned leather is durable and ideal for jobsite conditions. 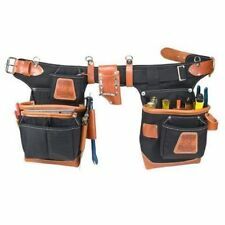 10 Pocket Pro Carpenter/electrician/construction nail and tool bag/Pouch in OIL TANNED Leather (NEW). It provides superior quality and functionality. A Quick And Easy Way To Organize Cluttered Toolboxes And Work Areas. Spring Loaded Ball Bearings On Each Clip Hold Sockets Firm And Secure. Holds A Total Of 86 Sockets. 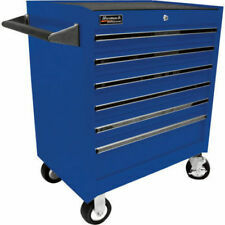 The CRAFTSMAN® 26-in wide 5-drawer tool chest is a great helper for any handyman. Arrange all your tools in the five shallow drawers in a single layer making them easy to locate in an instant. Ball-bearing drawer slides open and close smoothly and can each hold up to 50-lbs of tools. Wrench Rac is designed to magnetically hold from the center of the wrench. Adjustable holders- holds any size wrench. 15 pc magnetic holders. Magnetic back prevents sliding in tool box. Rest assured thatHORUSDY always has the right product for you. Pricing Includes 15% Discount, No Coupon Required! RED / BLUE SOCKET TRAY. THIS IS FOR 2 TRAYS, EACH TRAY HOLDS. HOLDS 80 SOCKETS. 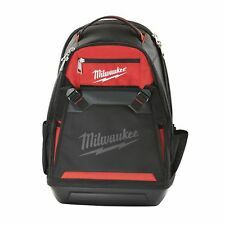 Milwaukee's Contractor Bags provide extra storage for job site tools and accessories. (1) Heavy-Duty Contractor Bag (50-55-3560). • Made of tough, water resistant 600 denier material. Length 16 in. Width 11 in. Steel Core 3pc 18in Magnetic Tool Holder Bar Organizer. Weight Capacity per bar: 22 lbs. Weight of each bar: 1.58 lbs. We manufacture tools designed for the DIY lifestyle. Size: 18in x 0.9in x 0.49in. (1) Electricians Work Belt (48-22-8110). Milwaukee Work Gear is Nothing But Heavy Duty. • Puncture Resistant Pocket. • Belt Slot - Fits up to a 3" work belt. 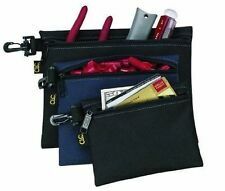 • 29 Pockets for organizing tools. • Stable Base - Allows pouches to stand upright on flat surfaces. 12v 18v 20v Dewalt Heavy Duty Tool Bag Drill Impact 11*5*9 12 18 20 volt New!! All that is pictured is what is included. Checkout our store for up to 60% off! Craftsman 5 Drawer Case Cabinet Garage Storage Auto Tool Box Chest Casters NEW! Craftsman 5-drawer tool storage center with riser is the best way to keep all your tools safely and neatly organized. No more hunting around for a tool you need-with this rolling storage center, you can find what you want right away. 4 out of 5 stars - Craftsman 5 Drawer Case Cabinet Garage Storage Auto Tool Box Chest Casters NEW! 25 product ratings25 product ratings - Craftsman 5 Drawer Case Cabinet Garage Storage Auto Tool Box Chest Casters NEW! 10 Pocket GENUINE SADDLE LEATHER Electrician Tool Bag with T-Chain and Tape Holder. Material - Saddle Leather, oil tanned leather. It provides superior quality and functionality. Durable Saddle Leather. 6pcs Socket Organizer Tray Rack Storage Holder Tool Metric SAE 1/4"" 3/8"" 1/2""